I don’t often read novels. Mostly on this website, you’ll read business book reviews . 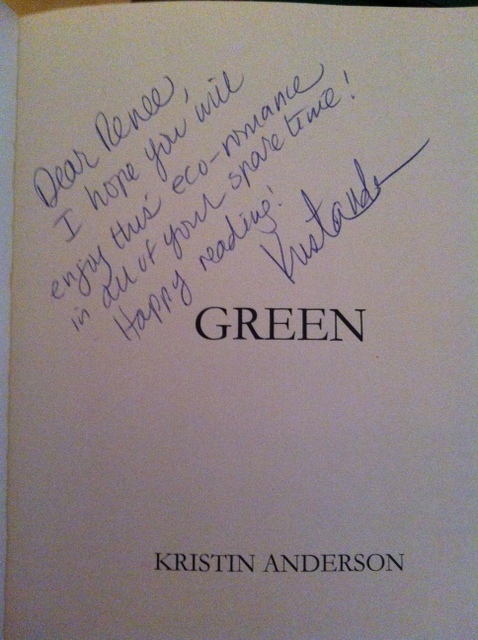 However when Kristin Anderson first told me a little about her upcoming debut novel, Green, at Connecting Women (a networking group we both attend) in The Hague, The Netherlands, describing it as an “eco-romance”, I knew I wanted to read it. After that conversation I needed to wait a few months for it to be released, and last week I was fortunate to have the chance to get my hands on a pre-launch copy. As you can see by the teasing comment Kristin’s written in my copy, she knows I don’t have a lot of spare time…but I made some and was finished it in days as I really enjoyed it! 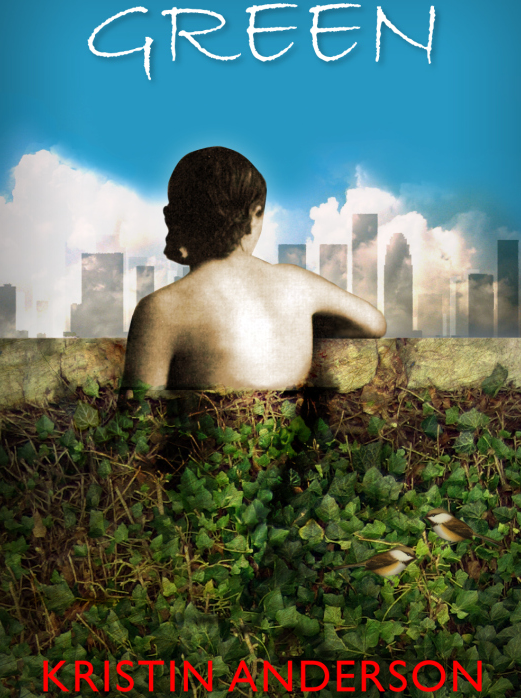 The story follows Ellie – who seems at first like your typical “city chick”. She does have “earthy undertones” that become more obvious as she meets and develops a relationship with Jake, an environmental activist. Kristin really hits a nerve with me – and no doubt many others – as she weaves through the modern daily dilemmas of how we choose to live and the effect on our environment, and in this case the effect on Ellie and Jake’s relationship. With believable characters who are well developed and an interesting and topical storyline, Green is an easy and enjoyable read for a lazy evening or weekend. One of the things I liked best about this novel is the links back to the real world. You may well find yourself participating in the Seven Change Challenge! 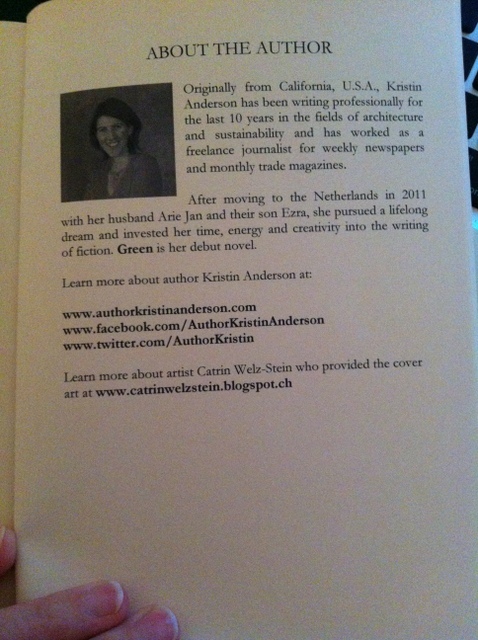 Kristin is holding her debut novel launch party in The Hague, The Netherlands on Saturday 16th November or you can attend the Virtual Book Launch no matter where you are in the world. She already has ideas for her next book, I might have to wait a while but will certainly be reading that too in the future. Great job Kristin…providing an enjoyable read and very possibly changing behaviour to save the planet at the same time! 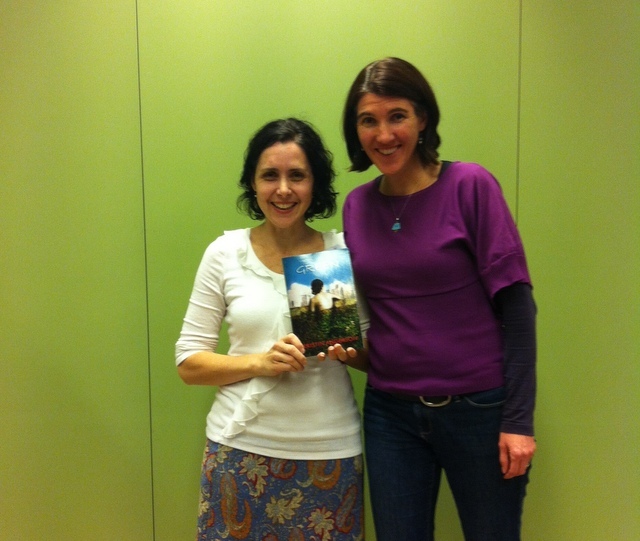 Here are Kristin & I at Connecting Women’s November meeting with her book – and a very appropriately coloured wall behind us!